We meet every Wednesday night at sunset in McAllister Park, located at 13102 Jones Maltsberger Rd, San Antonio, TX 78247,on the north side of the city, near San Antonio International Airport. 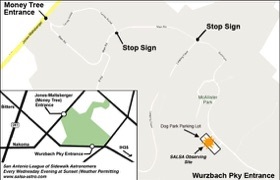 Look for us in the Dog Park and McAllister Trailhead Parking Lot. 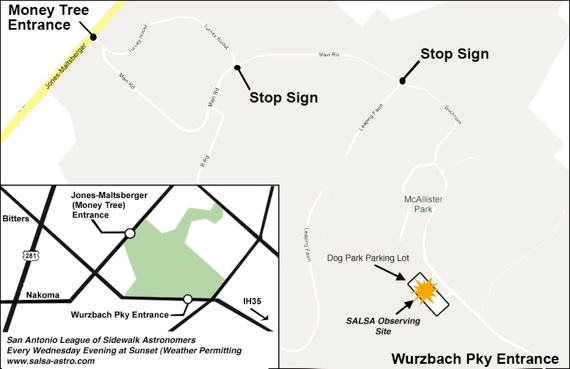 The easiest and quickest way (plus to avoid many speed bumps) is to come in from the Wurzbach Parkway entrance, via Buckhorn Road. Keep in mind that this is always a WEATHER PERMITTING event! If it is cloudy or rainy, we cannot see the sky. Please, check the Weather first! Do you have a new telescope you would like to learn how to set up and use? Then bring your telescope to the park! If you don’t have one, that’s fine too: just come and look through the many scopes on the field. This event is designed as a mid-week event to get out and relieve the stress of the work week. 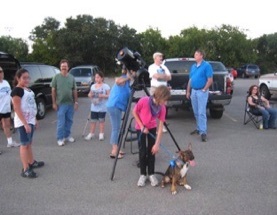 If you have ANY questions about getting into amateur astronomy, this is the event for you! You can see the cloud cover in San Antonio by clicking on the boxes below, to use the wonderful astronomer’s helper, the Clear Sky Chart. If there are too many white boxes showing, it’s probably too cloudy! When does the Sun set in San Antonio?